Dust is minute particulate matter hanging in the air which is present both inside our homes and work places and outside on the streets of our city. Some people may not be aware of this but dust causes serious harmful effects on our health such as many respiratory diseases and dust related allergies. Dust is actually any solid particle in the air that is less than 500 micrometers in diameter. Depending on where it is found dust can be classified into house or domestic dust, atmospheric dust, natural as well as man-made and space stardust which we can call cosmic dust. Nevertheless, the most common form of dust we are in continuous battle with is domestic dust which usually consists of dead human and animal cells as well as other commonly found particles in air. The importance of fighting dust comes from the serious safety risks and health effects dust poses especially if the exposure is for a long period of time. The consistent exposure to dust particles and house dust mite which feed on dust can result in the development of asthma and other respiratory conditions. That is why domestic dust control is important which can be simple as keeping a good airflow or removing and cleaning dust from surfaces where it is likely to accumulate or can be more technological to involve air filters, purifiers and personal protective respirators. We are now more able to fight dust effectively and protect ourselves from its harmful effects and allergies it causes due to the modern technology available. Companies in the cleaning industry are now well aware of all this and are in continuous competition to provide solutions for dust removal. From these many companies is Procter & Gamble which manufactures Swiffer the major cleaning duster brand that offers great dusting, sweeping and mopping solutions. Swiffer offers a wide range of dusting products including regular Dusters, 360 degrees Dusters, Dusters with extendable handles and Dust and Shine spray. Swiffer also provides a whole dusting kit that includes a handle and disposable dusters that can be used to remove dust from hardly reached places whether tiny or big. 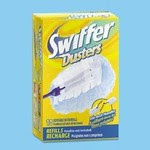 Swiffer dusters don't just disperse the dust but lock it in and remove it. Make sure you protect all your family against dust and also get a dust free clean home.